Grown since the Victorian era when it was recommended as "useful for covering pillars." Today it is enjoyed in pots placed in bright shade, later brought inside when temps fall. Lovely glossy green small leaves layered along the arching branches are dripping with clusters of rosy flowers at their tips. 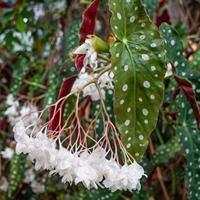 Silvery dots decorate the large angel-wing leaves, the reverse blushed a handsome red. Large tresses of immaculate white blooms spill from the strong stems in summer. Just right in a clay pot in a warm sheltered spot. Bring indoors to cheer you over the long winter. Also called Lady's Laces by old-country cottagers. The small, fresh green leaves in whorls and the sparkling white flowers, like clusters of tiny stars, make this perennial a treasure of the shady, moist garden. A ground cover, it spreads quickly to form uniform mats of green. Spring-blooming. Dry leaves have a fragrance like freshly mown hay and were once used as strewing herbs. Today we use sweet woodruff as an essential ingredient in May wine and potpourri. An award winning antique variety from 1883, 'Comte de Brazza' has ruffled blooms and a heavenly perfume. Prized for bouquets and corsages at the turn of the century, when sweet violets were all the rage, this variety is sure to rekindle a passion for violets. The origin of the Parma violets is unknown, however, Empress Josephine, who grew them at Malmaison, embraced them. 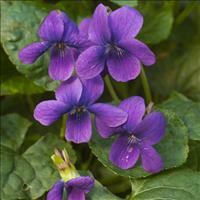 The most richly scented of all violets, the 1870 'Duchesse de Parme' has doubled flowers of lavender. Once grown for use in perfumery and corsages, we enjoy it today as a potted plant, where the petite flowers show to best advantage. Winter indoors in the North.Limited quantity. Our richest hued Parma, famously endowed with a heady fragrance, is the namesake of the second wife of Napoleon Bonaparte. Little rosettes of gathered petals sport white centers that set off the deep lavender petals. Listed as a new variety in an 1871 American garden catalog. A choice variety for pots! Advertised in Horticulture in 1906 by the originator H.R. Carlton as "the finest single, the freest bloomer, the greatest moneymaker ever offered for sale." This hyperbole was printed during the heyday of violets as cut flowers and corsage flowers. Long, strong stems carry the flowers high above the deep green leaves. Lightly scented, most noticeable in the early morning. A candy-pink intensely perfumed sweet violet that was popular in the late 19th century, employed in corsage making, nosegays, and in the crafting of perfume. It spreads readily and blooms in early spring, its delicate blossoms a welcome harbinger of warmer weather to come.